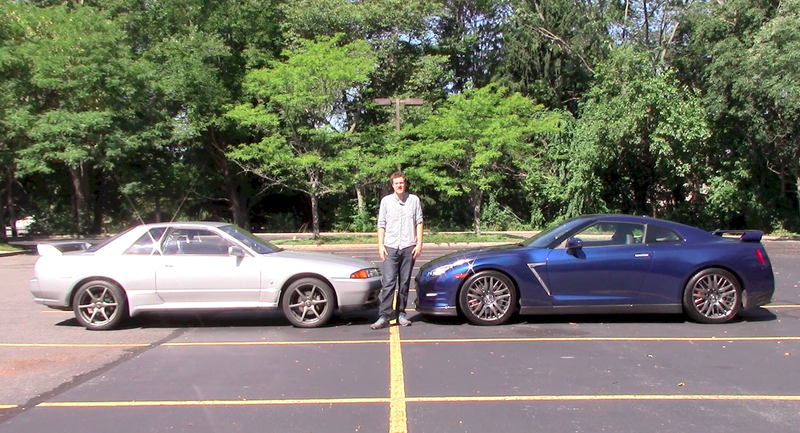 I recently had the chance to drive my 1990 Nissan Skyline GT-R back-to-back with a brand new 2015 Nissan GT-R. This was like driving a riding lawnmower back-to-back with a jet ski. You’d know all about my dual GT-R adventures if you followed me on Twitter, because I recently posted a picture of the two cars parked together. But what you wouldn’t know are their differences and similarities; the kind of in-depth analysis you can only get from a true comparison test. Unfortunately, you will not be getting a true comparison test. You will be getting one of my comparison tests. Before I get started, I think it’s important to explain why I’ve decided to compare my Nissan Skyline GT-R with the modern GT-R. This is for all the readers who think the Japanese only make reliable hybrid cars that go the speed limit in the left lane. So here’s the situation: in one corner, we have my Skyline GT-R, which was the first GT-R of the modern era. It came out in 1989, it was very fast, and some Australian car magazine named it “Godzilla.” This is because the only other forms of transportation in Australia at the time were full-size Holden sedans and adult kangaroos. In the other corner, we have the new GT-R, which debuted 20 years after the original. It’s fast. It’s loud. It’s powerful. And yet, it isn’t well-known outside the automotive enthusiast community. It is the official car for boyfriends pointing it out to their girlfriends when they see it on the street. I’ve decided to begin this comparison by going in-depth on acceleration and braking. For those of you skimming this column, I’ll make this part easy: do you remember the story of the tortoise and the hare? Well, the Skyline GT-R is like the tortoise. And the GT-R is like the hare, if the hare was actually a military fighter jet. Essentially, these cars are night and day. Don’t get me wrong: I love driving my Skyline GT-R. It’s pretty fast, and it’s pretty fun, and it stops pretty well, and it corners pretty nicely. But the new GT-R doesn’t screw around with all that “pretty” crap. Substitute that word for “insanely” and you have a better idea of how the GT-R accelerates and brakes. Here’s what I mean: when you put your foot down in my Skyline GT-R, you get the sense that you’re driving the kind of vehicle that’s fast, and exciting, and quicker than just about everything else on the road. When you put your foot down in the new GT-R, you get the sense that you’re driving the kind of vehicle that could obliterate a deer into chunks no larger than a thumbtack. It’s the same story with braking. When you slam on the brakes in my Skyline GT-R, it comes to a stop relatively quickly and without much drama. But when you slam on the brakes in the new GT-R, it’s like you’ve hit a giant wall made out of titanium and your brainstem is now hanging out with your eyeballs. Essentially, my view on acceleration and braking is this: when you drive these two cars back-to-back, it’s hard to believe that they’re separated by only 20 years. But enough about acceleration and braking, because even thinking about how fast the new GT-R starts and stops is making me queasy. Let’s talk about cornering. I’ve let about a dozen people drive my Skyline GT-R now, and they all say the same thing: it corners well. Steering is communicative, there’s little drama, and it goes roughly where you want it to go. It’s pure. But you don’t realize how far behind it is until you drive something like the new GT-R.
There’s a scene in the video that perfectly illustrates my point. We filmed a fake slalom in a large, empty parking lot, which looked so stupid at the time that I thought the YouTube commenters would make fun of it for days (“Teh slalom is so fake, u duchebag”). But when I watched it later, I realized that it perfectly illustrates the difference between my old Skyline GT-R and the new one. Then there’s the styling. Some say these cars share a resemblance. Others say they don’t. For my part, I believe that styling is a tremendously subjective category with a wide variety of tastes, and opinions, and perspectives. But anyone who says these cars look alike is wrong. Simply put, there’s no line, no crease, and no edge on my car that’s carried over to the latest GT-R. Any stylistic similarities between the new GT-R and the old one is purely in your head, since you know these cars are made by the same company and they hold the same spot in the lineup. My car is conservatively styled; effectively just a more muscular version of Nissan’s normal Skyline family sedan. But the latest GT-R is purpose-built from the ground up, with every detail designed to either enhance performance or ensure other drivers know exactly what they’re looking at. My car is a 20-story office building in downtown Milwaukee; the new GT-R is one of those crazy glass towers in Dubai that looks like a landing pad for alien spacecraft. It’s the same story on the inside. I’ve always told people that the interior in my Skyline reminds me of the 1987 Toyota Camry my dad had when I was a kid, because it does: both are basic, heavy on plastics, and low on emotion. The new GT-R is the exact opposite: nothing is basic. Not the gear lever, with the weird star-step pattern. Not the huge center screen, with gauges for every function and a steering wheel-controlled stopwatch. And certainly not the giant shift levers, which are larger than some species of monkey. And the engines? A lot of people say the new GT-R “shares its DNA” with my old Skyline GT-R because they both have turbocharged 6-cylinders. To me, this would be like saying the Ferrari 458 “shares its DNA” with Uluru because they’re both red. These powertrains have nothing in common: one is a dual-clutch automatic, one is a 5-speed manual. One is a 3.8-liter V6; the other is a 2.6-liter straight six. One makes an “official” 276 horsepower; the other makes 545. The only component shared under the hood is the Nissan emblem. A lot of people ask me if my Skyline GT-R paved the way for the new model. In a way, I guess you could say that’s true: they both occupy the same spot in Nissan’s lineup, since they’re both designed to be the ultimate in Nissan performance. But the similarities end right there. The new one is a completely different beast from my old model; a purpose-built supercar rather than the sporty version of a stoic Japanese daily driver. This isn’t unique to the GT-R. Consider, for a moment, the original E30 BMW M3: an analog car with average power, excellent handling, and only flared fenders and a rear wing to announce its high-performance presence. Now think about the new one: an ultra-fast computer-controlled luxury car with computers, sensors, and systems for virtually every process. Like the GT-Rs, both M3s are fun to drive. But like the GT-Rs, the M3s only really share one thing: a famous badge on the back.